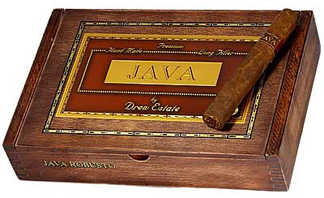 The Java is a box-pressed, mild- to medium-bodied cigar infused with the flavor of coffee, chocolate, and a hint of vanilla. The sweet Brazilian maduro wrapper provides the savory essence of coffee. The binder and filler are Nicaraguan. These premium, handmade Java cigars appeal to both the novice cigar smoker and the sophisticated aficionado.